Storms depart, leaving a wake of bright confectionary – plumes of spun sugar and whipped cream. Something bitter, something sweet. Something gold after something black. Grandma saying, "This too shall pass..."
Not too long ago, I wrote about participating in the Beads of Courage Design Challenge hosted by the Soft Flex Company. You can read the blog post about it by CLICKING HERE. It was a really awesome experience and I was happy that I was able to participate and show my support for such a worthwhile cause. The local paper, The Ligonier Echo, did an article about my participation in the project. You can click on the image above to see a photo of the newspaper clipping or you can CLICK HERE to read the story online. A customer stopped in and wanted to make a special necklace for a friend's daughter who was graduating from school. We talked about a bunch of different design options and I suggested that she should select a bird charm, to symbolize the girl's spreading of wings and flying free. We paired this gold-plated bird charm with two sizes of freshwater pearls and tiny brass spacers. The pearls are really stunning. Pearls are a traditional "coming of age" gift, but we wanted to keep the design fresh and young. So we used a more baroque style pearl. They're not perfectly smooth and have an iridescent green/blue/purple cast to the grey pearls. I'm quite pleased with the combination! It's simple, but it looks like it were knotted and has a nice feel to it. This is one of my favorite times in the garden. The plants are so full of life. It's energizing. Above are a few snapshots from around the property. To the left are my columbines. I admire this variety's hardiness and luscious color. In the middle is my lone peony. I used to get bunches of peony flowers, but the winter was hard and most of the rootstock became rotten in the ground. To the right are comfrey flowers. This is another sturdy plant with deep roots and pretty purple flowers. I'm told that brewed as a tea, it is a cure-all. Someone at the Botanical Society (which is where I got this plant from) said that if you took a bath in the tea, it would restore your virginity... which, of course, resulted in a riot of laughter. 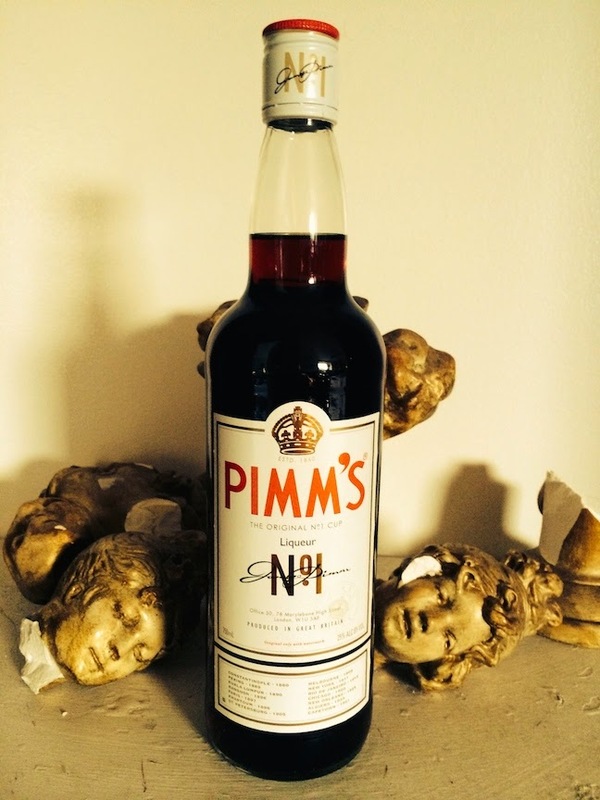 We've been reading "The Drunken Botanist" by Amy Stewart for Book Club and one of the beverages briefly mentioned in the book is Pimm's No. 1. It was really popular back in Brooklyn and I remember drinking this during the summers at rooftop parties. Apparently this herb-flavored gin-based liquor is an iconic summer drink in England. There are several different ways to drink it, but the most commonly enjoyed version is a Pimm's Cup, which includes sparkling lemonade and an assortment of fruit like sangria and muddled mint like a mojito. It can also be served with ginger ale or dry champagne. One of the secret ingredients is thought to be fenugreek, which has a slightly spicy maple flavor. Only after drinking a few of these did my brain make an unfortunate connection... the version with lemonade has a strikingly familiar flavor combination as the Master Cleanse. If you're not familiar with the Master Cleanse, it consists of only drinking a lemonade concoction that includes maple syrup and cayenne pepper for fourteen days. It's not an altogether unpleasant taste, but the effects of drinking it (especially for long periods of time) are... well... "cleansing". The past few nights, I've been restless and finding it hard to sleep. I just roll around and stare at the ceiling in the dark. I couldn't take it anymore and finally got out of bed. Normally it's pitch black in the house, but it was bright enough to navigate the piles of beads and boxes without any problems. I went out on the porch and saw the moon BRIGHT and very full. I think the culprit for my increased lack of sleep is a combination of moon energy and being "hungover" from the show in Milwaukee. Even though I've been back for a week now, it's hard to get back into the rhythm of things. It's a strange mixture of being blue, having a million ideas, and pure exhaustion. I feel like a cranky child who's too tired to sleep. Hopefully I'll be able to capture some of this midnight energy and make some of the things I've been dreaming of. Since I got back, I received several requests to see "the goods". We got loads of stuff for the store. Check out the Facebook page to see sneak peeks of all the things we brought back. CLICK HERE to visit the Facebook page. And make sure to stop by the shop on Saturday, June 21st for the New Product Release Party! We will unveil all the treasures and you'll be able to see everything in person! I got a bunch of unusual stones in different cuts and finishes. Aren't they juicy? I love natural stones, particularly ones that have an organic, from-the-earth vibe. 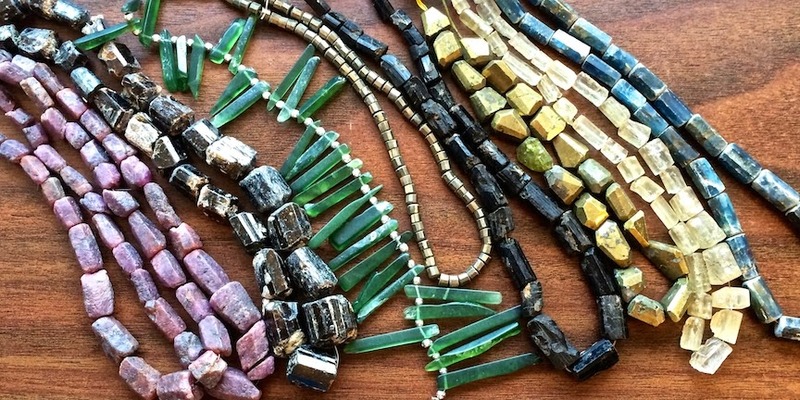 In the picture are rough rubies, color-change dravite tourmaline, serpentine, pyrite, black tourmaline, beryl, and kyanite. They're not in the picture, but I also picked up some awesome faceted rubies, labradorite, and tigers eye. I picked up a lot of artisan beads for the shop, but didn't have too much time to shop. I did manage to get a few! 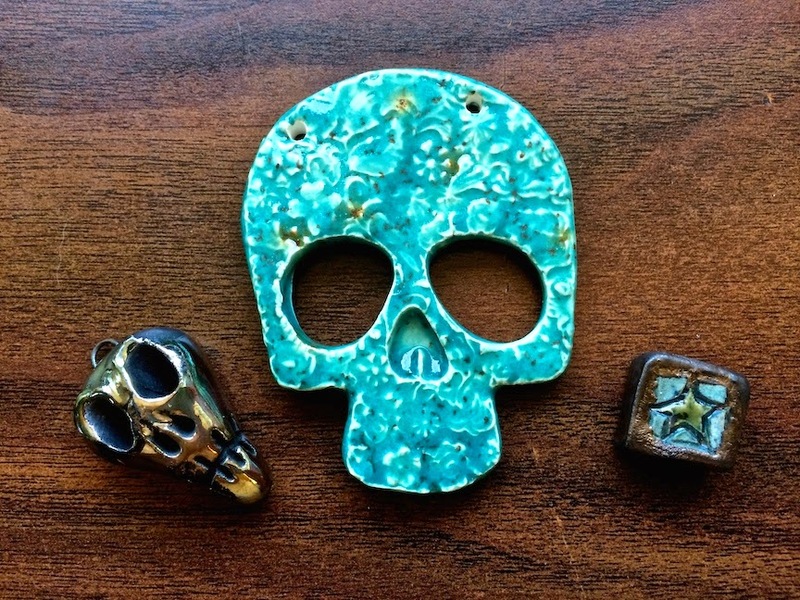 On the left is a raku skull from MakuStudio, in the center is a ceramic piece from Firefly studio, and to right is from the studio of Diane Hawkey. I didn't get this ring for myself, but I did get it for William. He is a fan of Kia's rings also. I teased him mercilessly, saying that since he didn't go to the show, he didn't get any treats. I even took pictures of my rings and sent them to him. When he picked me up at the train station, I presented him with the ring. It has an emerald and a silver band. 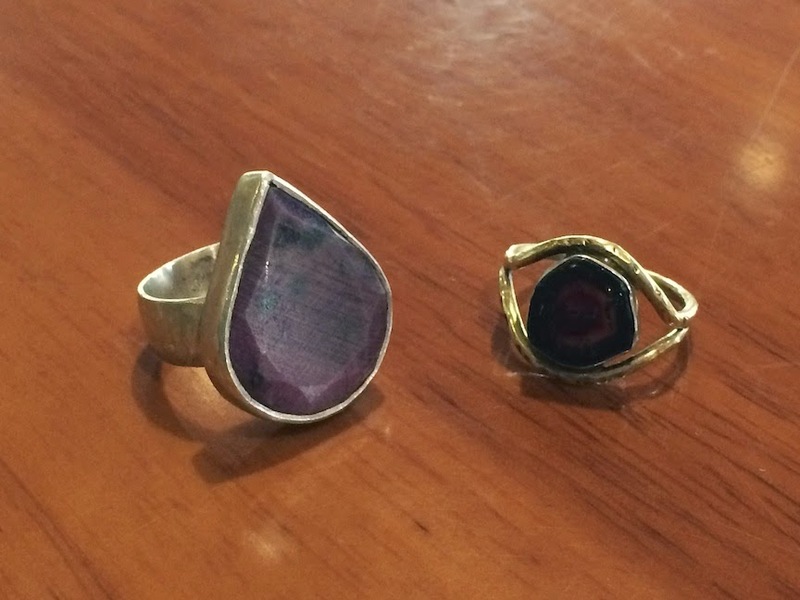 She made it during the same sitting as the faceted ruby ring that I got for myself. One of the evenings out and about in Milwaukee, Cynthia collaborated with the bartender at The Safe House and created a cocktail that we dubbed, "The Elixir". Someone else at the bar started ordering them and called it, "That Fairy Drink" and I could totally see fairies sipping this. It's sweet, floral, and refreshing. 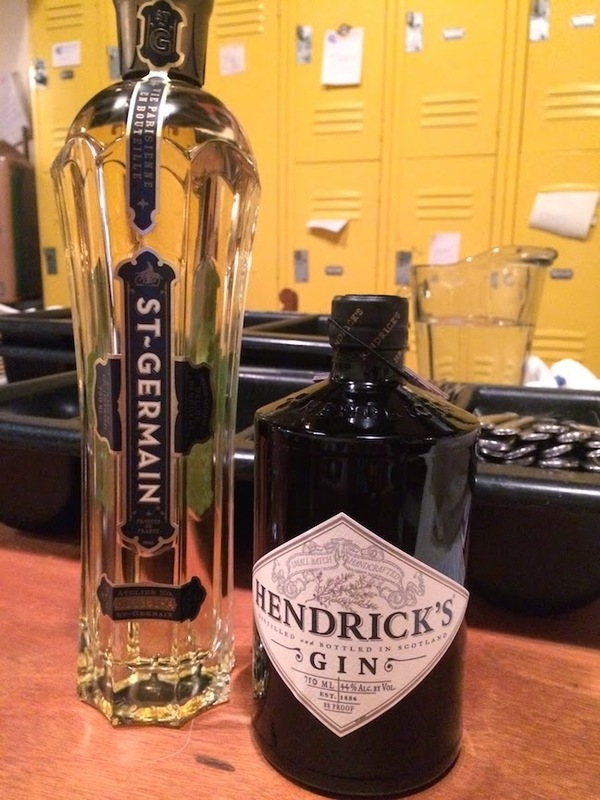 The ingredients are simple: 1 shot of St. Germain, 1 shot of Hendrink's Gin, 1 shot of water, and shaken with ice. It's apt that I've taken a renewed interest in mixology. We're reading "The Drunken Botanist" by Amy Stewart for Book Club and she talks about St. Germain and gin. St. Germain is an elderberry flower liquor. To me it tastes like lychee fruit, but has hints of citrus and honey. Gin is composed of several botanicals, including ingredients like juniper berries, orris root, grains of paradise, coriander, cubeb, fennel, ginger, citrus peel, cardamom, bay leaf, and angelica root. Hendrick's includes the unexpected additions of cucumber, chamomile and rose petals. Knowing that I've been missing my family, William picked up the ingredients! It's a spendy cocktail, using top shelf liquors, but it is the perfect drink to sip on while watching fireflies on an almost-summer evening. Sole survivor of a winter harsher than harsh, a blossom radiant. Fuchsia bound tight, opened with a little help. Tiny ants unleash the bloom. Rain battered, still strong, still there. I had the honor and pleasure to participate in the Beads of Courage Design Challenge hosted by Soft Flex Company. The concept of the challenge was that children who participated in the program were asked to design a bead to represent a selection of positive affirmations. The design then went off to a glass bead-maker, who then translated the design into glass. The bead then traveled to me, to be turned into a necklace that would be used to raise awareness for the program and hopefully raise money for the cause. 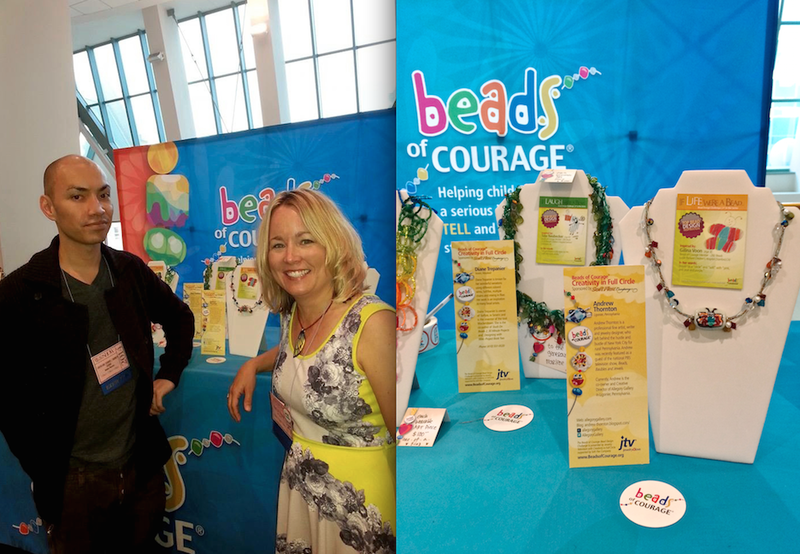 Above and to the left is a picture of me and Jean Baruch, the director of Beads of Courage. To the right is a picture of my design at the booth featuring the "Life" bead. Here's a picture of Sara Oehler of Soft Flex and Jean in front of the display of designs created for this challenge. It was a really great opportunity to show my support for a wonderful organization that incorporates art and jewelry-making into healing. They really do a great job and put so much of themselves into this worthwhile project! The trip home from these large gatherings of creative people is always a long one. I get a little blue after big shows. Not only do I start missing my family, but I also feel the void left from the absence of so many creative energies converging in one area. It's a heady mixture of swirling ideas and endless potential. These shows are a gathering of my tribe... of makers and creators of beauty. They are my family, my friends, and my creative comrades. And when it's gone, it is deeply felt. While the trip out was nearly seamless, there were some delays coming back and that set me back. I'm a seasoned traveller though and have learned that sometimes you've just got to roll with it. 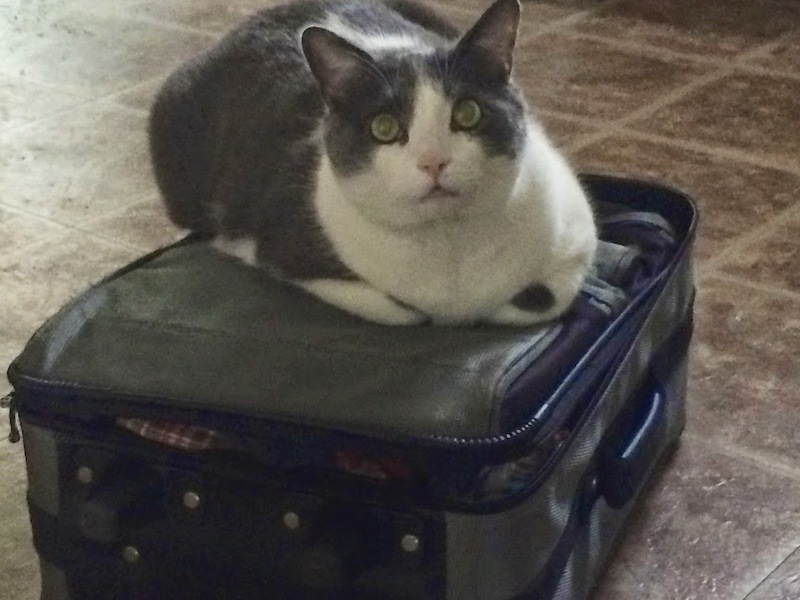 When I got home, I was greeted with furry snuggles and a very serious boy cat, protesting any travel in the near future. He had that "I'm too cute to leave behind" look on his face. And while I'll miss everyone and it'll take some time to get back to normal, it's good to be home. It's good to put my head down on my own pillow and dive deeply into the life I've created here. I talked with Gail Crosman Moore the other day at the show and she said that I had to see the Kandinsky retrospective at the Milwaukee Museum of Art. It was a must see! And so, I made a plan to visit the museum. It's an awesome venue. Not only is the building, situated on the lake, simply breathtaking, it houses an impressive collection... including pieces by friends and former professors. I always enjoy going there and try to make a point to do so when I'm in town. I made a plan to go before my train left. I would have hours to linger and soak in the artwork. But the last night, Cynthia and I hatched a plan. They were headed down to Chicago to visit with their friend and fellow artist, Jeremiah Ketner, and that's where my connection was. We decided to go in the morning together and then I'd hitch a ride with them and have a few more hours of family time. So... we didn't necessarily get hours to soak up the art... more like a rushed 45 minute sprint. But we got to see the show and it was so nice to finally see the paintings in real life. I studied Kandinsky in college and saw the color plates in textbooks and in slides. I saw some of the pieces at the Guggenheim. But never had I seen so many together and from so many different time periods of his artistic career. And it was just great. I think for those who aren't familiar with his work and the context it was created in, it might not seem that spectacular. Maybe because nowadays his techniques are taught in Color Theory 101 and by the time you're an adult, you've seen derivatives rendered on everything from menus, bathroom tiles, and modern cuisine platings. But to see them in person and to know that they were the spark... the originals... the things that broke the mold and helped open the door to the abstraction that is so common and accepted today... it was transcendental. I don't mean that in the pretentious way either. Looking at the pieces is like swimming in a sea of color, broken up by islands of shape and pattern. Brushstrokes sway with the rhythm of the tides – flowing, moving, filling up the canvases. After the museum, we hopped on the road and of course, stopped at the Mars Cheese Castle. We ate cheese curds, listened to music that Greg and Dwayne had collaborated on, and enjoyed spending the extra time together. One of the perks of doing the show this year was being able to spend time with my brother. We don't get a chance to see each other very often and it was nice to catch up. It was also a pleasant surprise to see all his new work! Dwayne has years of experience woodworking (as can be discerned from his AMAZING display), but he is relatively new to metal. He has grown leaps and bounds in such a short amount of time. It's exciting to see his progress and evolution as an artist. 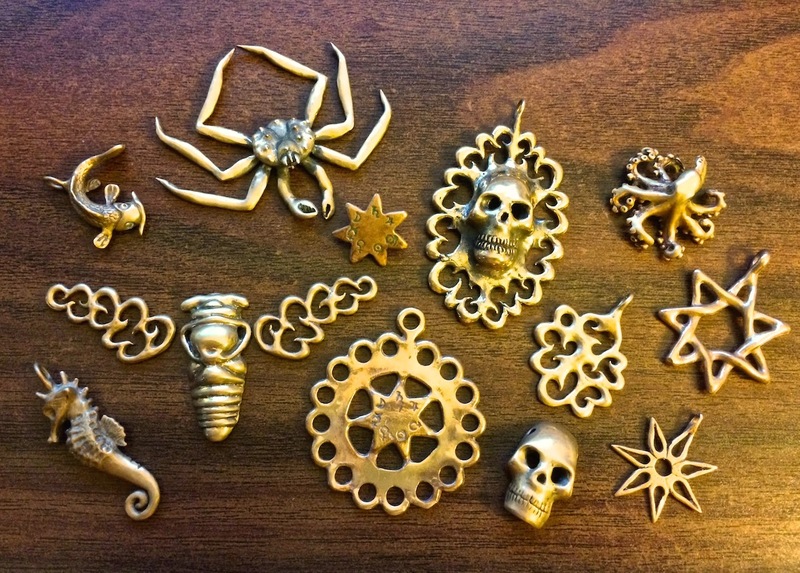 Above is a photo of his collection of pieces in bronze. Swirling arabesques recur often, as well as aquatic sea creatures and skulls. There are alchemical symbols and cicadas. I don't know if he intended it or not, but there's a story here... his story. A story of a man drawn to the sea, of being lost in the fog and kept back by thorns... of stars that guide and the end of one life, the beginning of another, transformation and rebirth. On the last day of the show, I got a chance to walk around. The first few days, I had to help out at my family's booth and didn't get to leave much. It was nice to run around the show and pick up things for the shop! 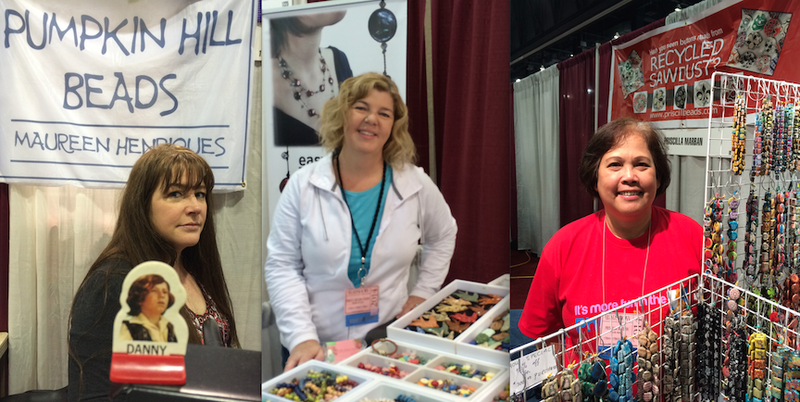 Maureen Henriques of Pumpkin Hill Beads (and Danny), Michelle McCarthy of Firefly Design Studio, and Priscilla Marban. Look who I ran into at Gary Wilson's booth! Susan Lenart Kazmer and Denise Peck. I hope they're collaborating on something! That'd be awesome! Katie Hacker at Beadalon, Abbi Berta of The Bead Place and Art Metal Components by Anju, and Sara Lukkonen of C-Koop Beads. Amy at the Bead Goes On. Kia!, Nikki Thornburg, Vlad of Golem Studio. 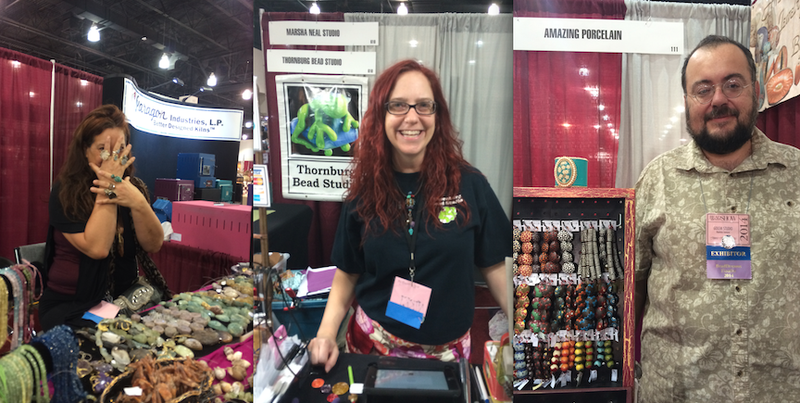 Heather Powers and Rosanne Garvison of HumbleBeads, and Anne of Gardanne. I started the day with a brisk walk to the Stone Creek Coffee a few blocks away from the convention center. I discovered it the day I got to Milwaukee. (This year I took a train and the coffee shop was located conveniently in between the train station and the convention center.) The industrial chic space had high ceilings, big tables, and a delectable selection of pastries and coffee offerings. The line to get into Starbucks snaked out the door and the thought of standing there B.C. (Before Coffee) broke my brain a little. Instead I opted for a much more leisurely start to the day with an iced coffee and a cheese danish. Kim Fox of Handfast Design, Wendy and Mackie Mullane of Vintaj, and Barbara Becker Simon. Jess Italia Lincoln of Vintaj and her mom, Trish Italia of Rustic River Finds. Suzanne Golden, Patti Bullard of Wubbers, and Adam of PJ Tool. Cathy Collison of the Trinket Foundry, Debra Saucier of Crystal Clay, and Sunyoung Park of Ezel Findings. Marcia DeCoster and Heather Trudeau of Peacock Fairy. After the show, we went to dinner at the Thai restaurant and then went to the Safe House for drinks and dancing. The Safe House is a spy-themed restaurant/nightclub and there were several bachelor and bachelorette parties going on. Even though we were pretty tired from working and all the festivities, we had an awesome time! Check out all this amazing new work from Bob Burkett! I snapped these pictures before the show opened the other day! Aren't the new pieces incredible? Most of them are made out of shibuichi (an ancient Japanese casting technique that alloys copper and silver) and some of the one-of-a-kind pieces are articulated and have moving parts! We are lucky to have Bob as a friend and mentor! I'm not usually an early riser. I'm normally a night-owl and tend to sleep in during the early mornings... BUT I got up early and walked to show. Our hotel was only a mile away, so I took advantage of the proximity and strolled over for coffee and pre-show shenanigans. You'd think that after being on your feet all day and socializing into the wee hours of the morning, that walking would be the last thing that I'd want to do, but I found it really invigorating. Maria Richmond, Erin Prais-Hintz, and Kim St. Jean and her husband, Norm. New Facebook Friend for life: Nancy Noyes-Ward, Kristin Oppold, and Leah Fairbanks. Laura McCabe, Loralee Kolton, and Lorelei Eurto. Janice Peacock author of High Strung: A Glass Bead Mystery, Irina Miech of Eclectica Beads, and Anne Mitchell. After working all day, we met up with some of our friends from the show to go to the Cher concert. Cyndi Lauper opened and it was a lot of fun! Going to the concert was kind of unexpected. None of us had planned to go, but we heard that she was going to be performing a few blocks away from the convention center. I saw Cher and Pat Benatar perform not too long ago in Pittsburgh with William and his mom and I told my sister about how cool the show was. After hearing about it, Greg surprised us with tickets as a treat! It was a great way to celebrate with our beady friends! Here's some new work that I made for the Bead&Button Show! When I say that I worked until the very last possible second, I'm not kidding! I was pulling things out of the kiln with tongs and heavy gloves! Here are the new porcelain pendants. I've been playing around with a more watercolor-esque glaze style. I think it goes well with the slightly distressed and tumbled look of my pieces. I brought some old molds out of retirement and used some new ones to create these pieces. I also made a bunch of cabs. They don't have holes and are perfect for bead embroidery, setting with epoxy clay, or incorporating into mixed media art. Of course, the possibilities are endless and they can be used in all sorts of applications. I made six new designs: a moth, a sugar skull, a koi fish, a honeybee, a flying swallow bird, and an owl. I used a different carving style to make the molds for these. The impressions are much more shallow and less heavy-relief style like my normal pieces. I think they're more reminiscent of my drawings. With their pastel colors and round, coin-shapes, they sort of remind me of SweetTarts or other candies like that. I'm super excited that I got them finished for the show! Train station monotony – a layover too long – leads to a stroll of Pittsburgh streets, dragging my suitcase. Steam rises off city pavement, and rain drizzles on gothic arches and me. Ava Motherwell from The Whole Bead Show, Leslie Pope from Twisted Sistah with Anne Gardanne, and Diane Hawkey. Kristal Wick from Artbeads.com, Becky Choi with Lynn Daley and Anne Choi, and Eva Sherman. Diane Fitzgerald, Lindsay Burke and Katie Wall of Fusion Beads, and Marti Brown of Odyssey & Bead Expression. Jill MacKay, Cathy and Aly Sly from LimaBeads, and Beth Botak of Kabela Design. Patti Cahill (with Cynthia photobombing), Julie Young of TierraCast, and Ashley Bunting of Xuron. Stephanie Dixon, Julie Gerlach who is the editor of Bead&Button magazine, Jean Baruch of Beads of Courage, and Rashan Omari Jones. Maureen Henriques of Pumpkin Hill Beads, Sara Oelher of Soft Flex Company, and Marsha Neal Minutella. Here's a little scene from outside the show in Milwaukee – the moon and seagulls over the Hilton. When I think about the show, I think about a gathering of tribes. It's a merging of creative energies. The thing that I love and appreciate about most artists is the sense of what could be. There's such a strong feeling of possibility and potential. It's a palatable forward momentum.